Is lipedema resistant to sport? Anybody who suffers from lipedema – a fat distribution disorder – which occurs mostly only in women – often hear it said, “Lipedema is resistant to sport”. But is there really any truth to this statement? Sport cannot provide a cure but can provide relief. It is a fact that lipedema is a disease of fat tissue, which cannot be halted even through excessive sport or fasting. As if a progressive increase in body fat mass is not enough already, those affected usually also suffer from severe pain. The only effective option to remove the abnormal pad of fat is liposuction, ie the surgical removal of fat deposits. Sports activities , however, can help prevent the accumulation of further pads of fat in addition to lipedema and help prevent lipedema from developing into lipo-lymphedema . Even if sport cannot in the case of lipedema promise a cure, symptoms and complaints can be noticeably reduced as a result. We will explain what is really important. In the case of lymphedema and lipedema Complex Decongestive Physiotherapy (CDPT) is usually applied. It should improve the condition and help avoid complications, such as joint pain or lipo-lymphedema. CDPT consists of manual lymphatic drainage, compression therapy , skin care, movement and self-management. Sport and self-management cannot only support the success of treatment but also improve quality of life and boost perseverance on the part of the patient. What should lipedema patients consider when doing sport? For those affected by lipedema the maxim should be: Reduce weight or at least don’t put on additional weight. It is not so much about strength training, but rather about moderate full body and endurance training. Gentle, low-impact training is important to prevent causing further damage to joints that are already subject to strain. Lipedema patients should make absolutely sure to wear if possible their compression stockings or tights when doing sport. For compression supports the muscles, the veins and the lymphatic system in transporting blood towards the heart and lymph flow in the direction of the lymph nodes . In the case of lipedema sufferers the function of the lymphatic and venous systems is often limited. Without the support of compression there is the danger of fluid sinking into tissue, resulting in further complications or swelling (edema). Lipedema – really resistant to sports activities? Sport in water brings many advantages to lipedema patients. Sport in water: whether swimming, aqua cycling, aqua fitness, aqua walking or water gymnastics: water exercises are not only low impact but particularly effective. For the water pressure functions as lymphatic drainage and decongests the legs. For this reason water exercises are also the only sport that can be done without compression. A positive side effect: water buoyancy reduces body weight to a minimum. This does not only train legs but also the back, arms and stomach. Trampoline jumping: A further very effective and gentle method is trampoline jumping. Bouncing on the trampoline not only strengthens the muscles but also stimulates lymphatic flow and at the same time increases fat burn. On the way down during a jump the muscles are tensed, while in the air they relax again. The compression stockings provide additional support for blood and lymph transport in the body. On the trampoline any movement is so much easier. Trampoline jumping also has a positive effect on intervertebral discs, because the spinal column contracts while jumping and the discs can be better supplied with fluid. That is why exercising on the trampoline is also suitable for preventing slipped discs. Fascia training: fascia is a band of connective tissue and encloses muscles, joints and bones as well as lymph channels like a sheath. It consists of water, collagen and glue. In the case of disturbed lymphatic drainage, which often occurs with lipedema, fibrinogen (a blood clotting factor) congests in the lymph channels and this can lead to the fascia binding together. Fascial connective tissue glued together can be the cause of lipedema pain. Fascia training should loosen this connective tissue again so that new collagen can form and the fascia can become suppler again. Fascia rollers for self-massage in different sizes and degrees of intensity can help release the adhesions. Please note: the exercises can be very painful at first till the bonded fascia loosens again. 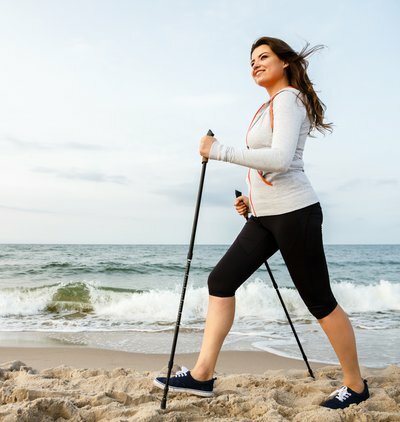 Nordic Walking: with Nordic walking all muscle groups are trained, even the arms which in the case of some patients are also affected by lipedema. Walking with poles is particularly gentle on the joints and can be quickly learned by the untrained. Cross-trainer: low impact and effective endurance training is also possible with fitness equipment, such as the cross-trainer. It trains eg legs, arms, the stomach and glutes. In contrast to jogging no strain is put on the joints.